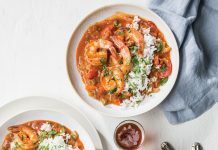 Those fortunate enough to be guests of Ivonne and Douglas Hoy during a Louisiana State University football game are greeted with warmth, hospitality, and if they’re lucky, Ivonne’s Red Snapper and Shrimp. She and her brother have modified the light, citrusy recipe that was passed down by their father, a native of Nicaragua. 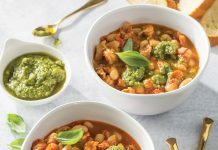 Ivonne experiments with surprising flavors by substituting parsley and mint for the customary cilantro, and changes it up regularly for seasonality. Louisiana seafood mingles perfectly with the traditional Spanish flavors. 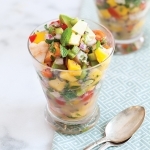 Try this Red Snapper and Shrimp Ceviche at your next gathering. We know you’ll love it too. In a large bowl, combine snapper, shrimp, bell pepper, onion, avocado, mango, tomato, juices, cilantro, parsley, mint, salt, and pepper. Make sure fish and shrimp are submerged. If not, add more lemon juice. Divide mixture between two gallon-sized resealable plastic bags. Refrigerate at least 12 hours. Serve with crackers or tortilla chips. If red snapper is not available, substitute any fresh, white, flaky fish.